Suburban location of an Indian chain restaurant based in Gujurat but specializing in southern Indian food. There's a second location in Mount Prospect (1014 Elmhurst, 224-734-3427). The menu at Sankalp, an Indian chain that got its start back in 1981, features a dizzying variety of "dashing dosaz," thin, crispy cylindrical crispy crepes griddled from lentil batter and rolled up around spicy fillings; "amazing uthappa," more like omelets, in that the fillings are cooked with the batter; and idlis, spongy, steamed, saucer-shaped cakes formed from fermented rice flour and seasoned in a variety of flavors. 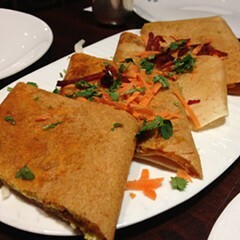 My group tried a couple of dosas: the "capsicum chilly garlic dosa," filled with fried, mildly spicy green chiles, and then a cheesy paneer-filled crepe. These were very fresh, paper-thin and crispy, made to order and served with small cups of sambar or rasam for dipping. They bode well for the all-you-can-eat dosa nights on Thursdays, on which you can customize your own from a buffet for $10.99. We also ordered a few curries and a rice dish: a hard-boiled-egg curry called; a Malabari fish curry with tilapia, a boring fish that was nonetheless fresh, silkily textured, and considerably brightened by its coconut gravy; and bisi bela huli anna, a buttery coconut-and-tamarind-spiked rice-and-lentil specialty of Karnataka. There's plenty more here to warrant further exploration. Alcohol prohibited.